Just who are Chesterfield FC’s FA Trophy opponents Bedford Town? Bedford Town are aiming to cause a major upset when they face their biggest game in two decades against Chesterfield in the FA Trophy on Saturday. One man that will be looking forward to the game more than most is Town’s assistant manager Nathan Abbey, who made 46 appearances in goal for Chesterfield during the 2001/02 season. 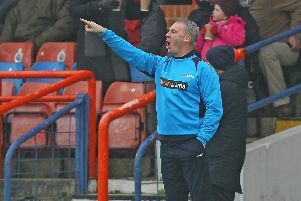 Abbey had joined Chesterfield following his release from Luton and went on to take the club’s player-of-the-year award, before he left Derbyshire after failing to agree a new contract. The Eagles, who made it all the way to sem-final stage in the 1974/75 season, have had a traumaotic history after they were disbanded at the end of the 1981/82 season when the lease on the Queen’s Park ground was terminated. They were reformed in 1989 and joined Division One of the South Midlands League for the 1991–92 season. Bedford Town made it as high as Conference South level after they beat Chippenham Town 3-2 in the 2005/06 play-off final. But it lasted just one season after they finished bottom of the league and were relegated back to the Evo-Stik Southern League. They finished bottom of the table in the 2013/14 season and were relegated into their current division. Town currently sit ninth in the Evo-Stik League South Division One Central table.